Chicken stock is nutritious and delicious on its own. It can also help to form a rich-flavoured base of any savoury dishes. Many of my readers and fans asked me where I get the chicken stock, whether I made it myself. When you are too tired or don’t have time to cook, the store-bought stock might be your first choice. I’m quite fond of using Campbell’s chicken stock (Hong Kong version 史雲生) for making Chinese dishes, especially for noodle soups, or the salt-reduced Campbell’s chicken stock (Australia) to make other dishes. 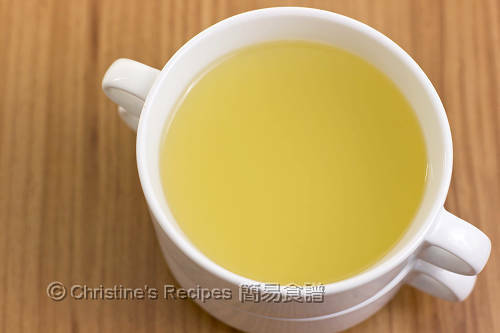 Homemade chicken stock is another choice. It’s quite simple and doesn’t take too much time than you expect. Best of all, you can have the real unsalted stock with rich flavours. All you need is to make use of some leftover chicken bones (carcass) and vegetables. You can use a whole chicken if you like of course. Put all ingredients in a large pot for several hours of slow cooking. Refrigerate or freeze it until you’re ready to use them. Rinse the chicken bones. Chop into smaller pieces if necessary. Blanch in boiling water to remove blood and impurities, for about 3 minutes. Drain up the bones. Set aside. Put the chicken bones, water and all other ingredients into a large deep pot. Cook over high heat. Bring it to a boil. Reduce heat and simmer for about 3 hours, until about 2 liters of water left in the pot. Strain the stock through a fine sieve placed over a large bowl. Don’t press on the vegetables when straining. The soup won’t be clear otherwise. Let it cool down. 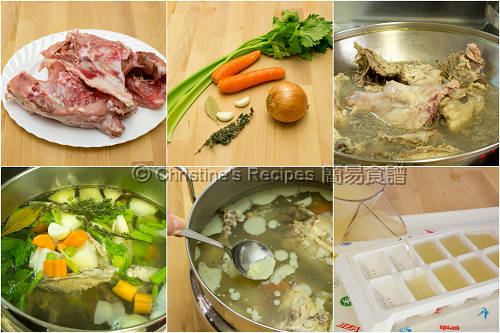 Refrigerate and the fat will solidify on top of the stock, that can be easily removed with a spoon. The stock can be stored in an air-tight container in fridge for up to a week. I can't give up buying carcass (chicken bones) when I see them in the stores here cos they don't have chicken carcass everyday! :( So when I see them, sure to grab a few for chicken stock /soup! Hi Chiristine. This recipe is very useful for me. 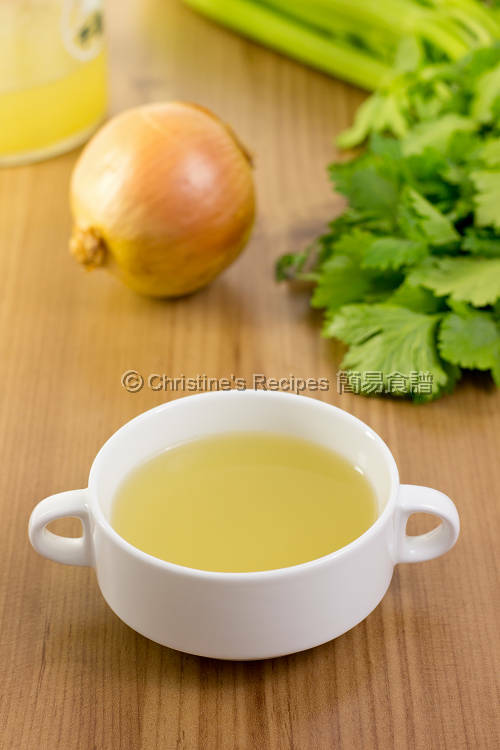 Previously i did feel query on the method of making chicken stock. Love your blog~ thanks for sharing your recipes! The chicken stock is so versatile. Can't cook without it. Can you explain further how you blanch the chicken before cooking the soup? Can this be done for pork ribs as well? Is there an easier, faster way to do this step? Simply put the chicken bones in boiling water and cook for 3 minutes. You'll see some blood and impurities released in water. Drain the bones. Discard the water. That's it. Yes, same when blanching pork ribs. Can I use a pressure cooker for this? Thank you. Sure, you can. Pressure cooker is good for making stock.